A matchbook cover for Rickshaw Boy, Courtesy of Mary Mallory. Graphics, films, advertisements, music – all demonstrate values and cultures of the time and place in which they were created. Words, phrases, or images considered acceptable at that time can often be considered demeaning or racist to future generations. Seeing them reveals a society and how far or little it has come. California is a remarkable laboratory for understanding the evolution of thought and behavior towards people of other races, particularly the Chinese. Many Chinese first came to California during the Gold Rush fever of the late 1840s. Later their dedicated work and sacrifice helped build the railroads and vast agricultural empires that crossed the state and helped it expand in population and importance. When times became bad, however, white authorities blamed “the other” for problems they themselves created, angry and resentful that people like the Chinese were succeeding through hard work, dedication, and sacrifice. Laws like the Anti-Exclusion Act were enacted to limit their rights to become citizens, own property, or even marry. A matchbook cover for Ah Wong’s Coolie Hut, courtesy of Mary Mallory. At the same time, many Anglos were intrigued by Chinese culture and their arts, food, and even dress, which began influencing popular culture. Chinese restaurants sprang up, some in Chinatowns that catered to Chinese, and others on the outskirts of these areas appealing to tourists or the curious. Chinese food, tasty and lower priced than other cuisines, quickly became popular. The Studio City area became particularly intrigued with Chinese cuisine in the late 1930s and then again in the 1960s, thanks to waves of popular culture and world events. There were several Chinese restaurants, but only those with a more movie oriented or successful clientele like James Wong Howe’s Ching How receive much notice in the newspapers. They mostly leave behind traces of ephemera like matchbooks, menus, and the like on which to build history, revealing ideas and portrayals considered derogatory today. An ad for the Keys, 3969 Lankershim Blvd., Van Nuys News, April 17, 1955. In 1939, William W. Wong opened Ah Wong’s Coolie Hut at 11916 Ventura Blvd. in Studio City. Wong, born in California in 1910 and residing at 14629 Lanark Street in what is now Pacoima, leased the building from the Muller Bros., who built the building in 1939 with the help of contractor Horace Shisler. The roof is repaired in 1944, but nothing indicates if Wong is still operating his restaurant. By the 1950s, cocktail lounge Jimmy O’Brien’s occupied the location. A Chinese restaurant on Lankershim Boulevard across from Universal becomes popular in the early 1960s, called Rickshaw Boy. Perhaps named after the 1945 English translation of Lao She’s book about a poor Beijing rickshaw driver, the restaurant occupied the location of a long time North Hollywood restaurant, dating to 1919. An item on Rickshaw Boy in the Los Angeles Times, January 1963. In 1919, John B. Foster began operating a small lunch room at 3969 Lankershim Blvd., right across from Universal Studios but actually located in North Hollywood/Studio City. Possibly the only small eating establishment near the studio, it grew in popularity, requiring additions in 1920 and 1925 before having to rebuild its front facade in 1928 after the widening of Lankershim Blvd. Called the JB Cafe in 1937, Foster also operated a barber and small jewelry shop in the same building by the 1940s. By the mid-1950s, Julia Keys and family owned and operated the business under the name the Keys Club. They erected an electric sign in 1954 to promote their cocktail lounge, which featured both a piano and Hammond organ played by David Barrett. James “Jimmy” Hing, formerly manager of Ah Fong’s restaurant in Beverly Hills for seven years, decided to open his own Chinese restaurant at the location in 1962, perhaps because some of his best clients worked at Universal. 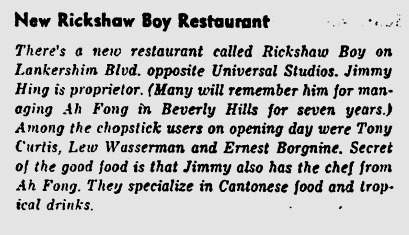 Opening December 16, 1962, Rickshaw Boy prepared Cantonese food, along with selling such American favorites as fried chicken. The January 13, 1963 Los Angeles Times reported that Universal executive Lew Wasserman and stars Tony Curtis and Ernest Borgnine attended opening night. An ad in the Los Angeles Times for Rickshaw Boy, 1963. Universal stars and executives flocked to the restaurant per newspapers and trades, with many accounts pointing out how diverse customers’ wardrobes could be. The March 22, 1963 Los Angeles Times even noted that the cast of Gregory Peck’s “Captain Newman, M. D.” came to eat lunch, some in pajamas. By late 1964, however, Universal desired the location for more than just food. Mike Connolly reported in his column that Lew Wasserman was purchasing the business. Rickshaw Boy continued for another two years, before Hing moved his operations strictly to his Confucius Delicatessen, one on Broadway in downtown Los Angeles and another at 3506 W. Jefferson Blvd. Universal pulled a demolition permit April 7, 1966 and just three days later knocked the building down to use the location for parking. 3969 Lankershim Blvd. is still a parking lot today, this time for the MTA station adjacent to the Campo de Cahuenga. While these Chinese restaurants show that their food was popular with local residents, the advertising employed by Chinese owners and operators demonstrates the accepted subtle racism of the time. Thankfully society has moved on and becoming accepting and inclusive to all without resorting to caricature. This entry was posted in Architecture, Film, Food and Drink, Hollywood, Hollywood Heights, Mary Mallory, San Fernando Valley and tagged #Studio City, Chinese food, film, food and drink, hollywood, Hollywood Heights, Mary Mallory. Bookmark the permalink. I had no idea James Wong Howe had a restaurant.